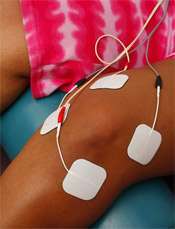 Interferential Electro-Therapy is a therapeutic treatment utilized to help relieve pain and promote soft tissue healing. During the interferential electrical stimulation process, tiny amounts of electrical impulses are introduced into the tissues in the vicinity of the injury. In turn, a middle-frequency stimulation is created when these waves intersect below the surface of the skin. This prompts the body to secrete endorphins and other natural painkillers that help relieve pain and accelerate the healing process. Alleviation of painful symptoms, tingling and numbness.